Every year, the NIU Alumni Association recognizes 10 alumni for their professional accomplishments. Among the 2017 alumni award recipients recognized at the Thursday, May 4, banquet was Joyce Marie Barra, Ph.D., RN, who recieved her B.S. in Nursing in 1980. Barra is an instructor at Weber State University in Utah, where she teaches nursing courses and is a member of the Institutional Review Board. She has also served as director of the master’s program in nursing. She has worked as a staff and charge nurse for 12 years, working at Cottonwood Hospital in Murray, Utah, Lutheran General Hospital in Allentown, Pennsylvania, St. Luke’s Hospital in Allentown, Pennsylvania, and Albany Medical Center in Albany, New York. 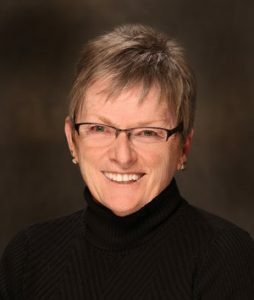 She developed the University of Utah Hospital and Clinic Partnership in 2008 to educate employees within the institution and served as interim dean in 2008 at Salt Lake Community College for the School of Health Sciences. Barra also works as an independent consultant to academic organizations and health care institutions, specializing in self-study preparation, guidance, review, follow-up recommendations and accredited programs from the Accreditation Commission for Education in Nursing. Her consulting services continue to be in demand nationwide. She has been involved in a number of projects in Southeast Asia and is on the board of directors of the Shanghai Medical Workers College in Shanghai. Her volunteer work includes helping the National Charity League and the Ronald McDonald House, and she has been published in several professional journals. She is currently conducting research relating to the roles and responsibilities of care management processes through the Utah Cluster Acceleration Partnership.